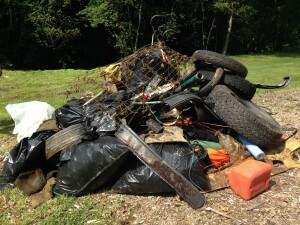 Second Annual Lopatcong Creek Cleanup! Meeting location – just west of Norton’s Cork & Bottle Liquor store on S. Main Street in Phillipsburg – just across from Kent Street. Our banners and volunteers will be easy to spot. **We are asking for your help in getting this event out there. There isn’t a lot of time for marketing or gathering support, however we did not want to forgo our first opportunity to get out on the creek to do some hands on good for our community! Please tell your friends and neighbors. This is truly an excellent chance for each of us to contribute to the health and well being of our own hometown resources. *Join our Facebook event, share it, and invite your friends! We greatly appreciate your support! Please sign up here if you are interested in getting involved as an individual, as a family, or as a group in this or other activities. This is an excellent opportunity to participate in a community service activity that benefits us all! We are eager to build a team of volunteers for upcoming events and activities. If you’re interested in joining our team, want to stay informed, have questions or suggestions to share, please complete our volunteer/contact form. Yes, I'd love to bring my family! Yes, I'd love to bring a group of volunteers! If you are with a local group or organization, please enter the name below. Do you have any questions, suggestions, or other information to share? Please use the space below to let us know!